Mayor Bob Bratina says he has no plans to just quietly walk into the sunset and hasn't been scared into a corner by Peggygate. 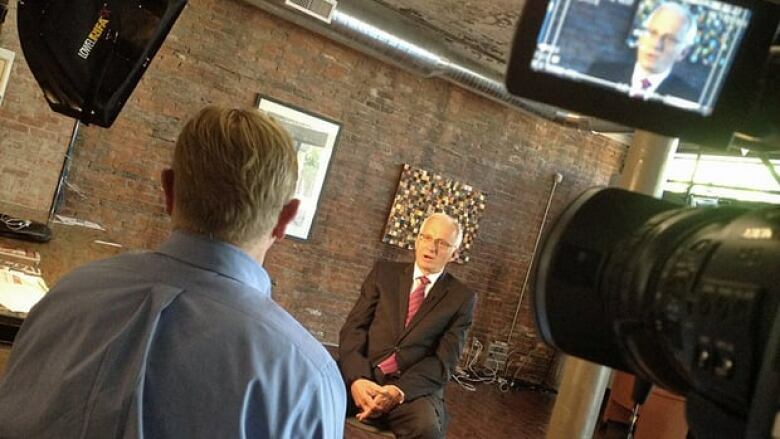 Mayor Bob Bratina says he isn't sure he will run in 2014 for a second term in the city's top spot. But he says has no plans to "just quietly walk into the sunset" and he hasn't been "scared into a corner" by Peggygate. In a 20-minute interview Friday morning with CBC Hamilton, Bratina talked about the sometimes raucous behaviour at city hall and his plans for the remainder of his term. Bratina became the first mayor in post amalgamation Hamilton to be censured when council voted 15-1 in late March to censure him. Former mayor Fred Eisenberger escaped a similar fate in 2008 when a vote to censure him failed. Glanbrook councillor Dave Mitchell has been censured twice. Asked about his plans for a run for a second term, Bratina said, "It's premature to say what I'll do for the 2014 election but I have no reason not to consider that I would run again." "What you have to understand is that I've taken a pummeling about who I am, my character and all that which has led some people to believe that I've been scared into a corner and I'll just walk into the sunset." Asked if he was a polarizing figure, the mayor said, "Things have to change. What you are seeing is the reaction from people who may not want to change against the person trying to make the change, and I accept that." He acknowledged that things are not always polite at council but conduct has improved significantly during his term. "The last meeting of the last council ended in an argument because of a snide remark from the chair to one of the councilor," he said. "That’s not what the chair is supposed to do." Bratina says there are indications the city has had a good year with promising signs of recovery. In the remainder of his term, Bratina wants to make poverty a priority and hopes to launch a nutritious breakfast program for poor children in the city.